Background: Bismuth titanate (Bi4Ti3O12) is one of the prominent candidates in lead free ferroelectric/piezoelectric materials and also in photocatalytic materials. Moreover, it is mainly utilized in the piezotronic-smart material field. Bi4Ti3O12 demands more efforts to enhance its functional properties by modifying its chemical as well as physical features. Currently, the new class of materials is required to fulfill the necessity of multi-functionality with better performance. In this context, we proposed a novel model material and fabricated it in a facile way. Methods: In this report, we present a one-step route to synthesizing and studying of the smart material xBi-Bi4-xTi3O12-y-Bi4Ti3O12 at real-time mode in High Resolution Transmission Electron Microscope (HRTEM) at micro-scale level. 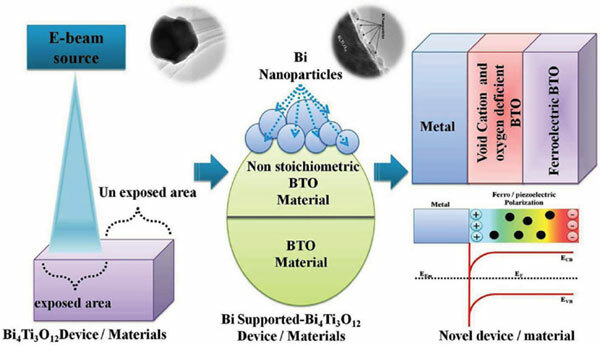 Results: Bi4Ti3O12 shows significant changes under e-beam, which is converted into Bi metal nanocrystals decorated on the non-stoichiometric A-site deficient Bi4-xTi3O12-y microparticle. The surface and electronic characteristics study demonstrates the presence of Bi and also divulges that there is a modification in electronic band structures. The Fermi levels of the non-irradiated and irradiated Bi4Ti3O12 were found to be 1.45 ± 0.1 eV and 1.8 ± 0.1 eV above the valence band maximum, respectively. The chemical composition analysis of the resultant material shows signs of the existence of xBi-Bi4-xTi3O12-y-Bi4Ti3O12. Conclusion: A new class of multifunctional material like metal-n-type semiconductor / ferroelectric (xBi-Bi4-xTi3O12-y-Bi4Ti3O12) is synthesized at a micro-scale level in HRTEM and investigated systematically. The formation of the novel structure may follow the Knotek-Feibelmen mechanism involving the Auger decay of oxygen and local bond-breaking phenomenon in Aurivillius phase double layered perovskite Bi4Ti3O12. Keywords: Band engineering, Bi4Ti3O12, electronic structure, ferroelectric, functional material, transmission electron microscopy, x-ray photoelectron spectroscopy. Keywords:Band engineering, Bi4Ti3O12, electronic structure, ferroelectric, functional material, transmission electron microscopy, x-ray photoelectron spectroscopy. Abstract:Background: Bismuth titanate (Bi4Ti3O12) is one of the prominent candidates in lead free ferroelectric/piezoelectric materials and also in photocatalytic materials. Moreover, it is mainly utilized in the piezotronic-smart material field. Bi4Ti3O12 demands more efforts to enhance its functional properties by modifying its chemical as well as physical features. Currently, the new class of materials is required to fulfill the necessity of multi-functionality with better performance. In this context, we proposed a novel model material and fabricated it in a facile way.